Business and family – can you have it all? 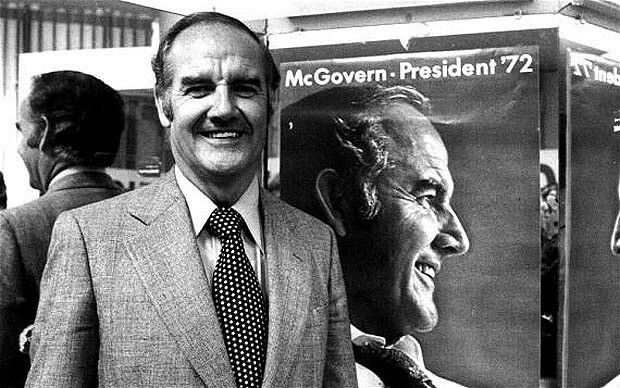 George McGovern died this week. He is probably most remembered, if at all these days , as “the liberal presidential nominee routed by Nixon” in 1972 (a result which America may well have later regretted). In 1994, his daughter Teresa, who had suffered from alcoholism and mental illness, froze to death, acutely intoxicated, in a car park snowdrift in Madison, Wisconsin at the age of 45. Hang on George, you were busy fighting a good fight: against the war in Vietnam, the draft, and incomes below the poverty line, and for civil rights. You were doing really important things. His regret jumped out at me, I suppose, because I had been having a few reflections myself about fatherhood. Can great things, even just good things, get done without a price, without somebody suffering for their achievement? I’ve been chatting with a CEO recently, who has been involved in an enormous reconstruction effort in an organisation which was standing on the edge of a self-dug precipice. He has paid a price and so has his family. I thought about the other CEOs with whom I have worked closely in my career, 6 of them, and another half dozen whom I have coached or advised. In nearly every case, the demands of their job meant sacrifices for their families. You can’t lead any organisation, in my experience, without having to put in at least one and a half times the effort set out in your position description. Without some sacrifice, realistically the job just won’t get done. You’re usually not just doing it for your own glorification, or the allegedly inflated salary. You are responsible for the security and income of the shareholders, the jobs of the staff, and the interests of all the other stakeholders. If you are a non-profit CEO, you have the added responsibility of “the cause”. You are doing important, meaningful, even essential work. But at home your partner, your kids, your dog, often pick up the crumbs of your time. The CEOs whom I have seen resolve the business/family divide most successfully are the ones who had a clear acknowledgement of the time they would need to devote, the willingness (though often grudging) to devote it, and the recognition that it would come at some family cost. Also, an explicit belief that it was the right thing to be doing at that time, rather than letting it happen by default. Oh, and did I mention an incredibly understanding and supportive partner? The ones who didn’t had troubled, or crumbled, relationships and families. So here is my two bob’s worth – no, you can’t have it all. But what you might be achieving on one side can validly go towards balancing what you might be missing on the other. Just do it with your eyes (and your family’s) open. It’s that season again, when your organisation needs to hold its annual general meeting. I have seen AGMs conducted badly, and possibly invalidly, for want of a little bit of procedural knowledge. The chair is probably stressing already about having to run the meeting, remembering how they had to fluff their way through it last year. So here is a mug’s guide that should allow your organisation to hold an effective AGM which meets the legal requirements. You don’t have any of the variables referred to in the PS at the end of this blog. Declare the meeting open (and note the time for the minutes). Welcome those present, and note there is a quorum (you will have checked this in the constitution before opening the meeting, because the meeting can’t formally start until a quorum is present). Note who is present – directors, members, auditor, observers or visitors – and any apologies received, so these details can be recorded for the minutes. Note that the notice of meeting has been sent out. Take the notice as read. Remind the meeting that all the business at an AGM is special business (which is business of which prior notice has been given), so only the agenda items specified in the notice of meeting can be dealt with at the meeting. Deal with the minutes of the previous AGM. (As these minutes will hopefully have entered in the company’s minute book within a month of the previous meeting, you generally won’t be approving the minutes of that meeting at the next AGM.) Just note that the minutes of the previous AGM have been entered in the minute book and members can inspect them or ask for a copy. Deal with each agenda item in turn. The first item is likely to be the receipt, adoption or acceptance (however it is phrased in your organisation) of the annual financial statements, the directors’ report and the auditor’s report. Invite questions and comments from members. (The law provides that the chair of the AGM must allow a reasonable opportunity for members at the meeting to ask questions about, or make comments on, the management of the company. When all questions have been satisfactorily dealt with, it is usual practice for the chairman then to advise the meeting that the annual financial statements and reports are received by the meeting. Although it is not a legal requirement, some organisations like to pass a formal resolution receiving the accounts and reports. If yours is one that likes to do this, clearly state the resolution to be passed in the form set out in the AGM notice. Then ask all members in favour of the resolution to raise their hands. Ask for all members against the resolution to raise their hands. Declare the resolution passed (or not, in the unlikely event that the majority of members has voted against it). Deal with each remaining resolution in the same way – state the nature of the resolution; invite questions or comments; formally state the resolution to be passed in the terms set out in the AGM notice; conduct the vote; announce the result. Remember, if directors are being elected or re-elected at the meeting, each director must be elected by a separate resolution. There may be items on the agenda that require special resolutions, such as amendments to the constitution. If so, note when stating the resolution that it requires a special resolution, and if and when it has been passed with the required majority, advise the meeting that it has been passed as a special resolution. When each resolution has been dealt with, note that there is no further business, and declare the meeting closed. You do not have to accept any further business or motions from the floor of the meeting. Note the closure time for the minutes. It can be really helpful to write these steps down in a script for the chair to follow, so essential steps aren’t missed in the heat of the moment. If you follow these simple steps, you can take the stress out of the AGM, and meet the legal requirements at the same time. Happy AGM. I’ll provide some plug-in steps for these situations in the next blog. When I was a much younger lawyer, I had one suit which I kept hanging in the cupboard at work. If I had to go to court, I’d change into the suit. The rest of the time I would get around in a motley collection of pants and jackets. In my head it was all about my abilities and my results, not how I dressed up. Then my career took off in a much steeper trajectory, and it was, not co-incidentally I believe, about the same time I bought two snappy Italian suits and shaved off my beard. Within the Melbourne corporate and professional establishment (into which I had been thrust by my employer) there were some things that had to be conceded if you really wanted to make your mark. I had that same kind of issue with a board I recently reviewed. The organisation has had some significant successes in getting to their current stage of development, but needs to take the next leap forward. the skillsets on the board are heavily skewed towards the organisation’s core business, with only two out of ten having backgrounds outside that core. The funders are looking for some assurance that there is an objective overview of the organisation’s financial situation – they would like to see some solid and independent financial or accounting expertise on the board. Look, I know that even the ASX Corporate Governance Guidelines say: “There is no single model of good corporate governance”. But the Guidelines also say that if you don’t meet their version of best practice, then you need to explain why. Unfortunately, one or more of their funders may not find that sufficiently convincing enough to keep writing cheques. The board has said it is considering making some changes to their structure, and hopefully those changes will be soon enough. So while you may think that just having a structure that works for your board is good enough, there are expectations of others, often drawn from bitter experience, which dictate that sometimes, to be able to play the part most effectively, you also have to look the part. Particularly for up-and-coming corporate lawyers. I’ve never been a CEO; I’ll fess up on that one at the outset. I was going to have a shot at it on two different occasions, and thought the better of it. For the past 20 years though, I have sat beside a whole range of CEOs as company secretary, colleague, coach and chairman. I have seen the good, the bad and the hopeless. A deep wellspring of energy. The demands are huge, and unless you have been in close proximity to a CEO in daily action, you might not see the effort required. An ability to see the big picture, and in particular where the organisation they are heading sits in the wider world. The pressure from the board, the market and other motley stakeholders to focus on the immediate and the specific, rather than beyond the current financial year cycle, is intense. A willingness to get down and dirty in the detail when required and actually understand the inner workings of the business: and, god forbid, even write the first draft of something really important instead of throwing that task to an underling. A thick skin which shelters and protects them: from the intra-firm political machinations; the detached thoughtlessness often displayed by the board of directors; or the short-sightedness of executives protesting against near-term pain in the cause of medium-term gain. The capacity not to take it personally as a CEO is priceless. Sufficient self-awareness to enable them to temper a highly-tuned ego, an unavoidably essential attribute for an effective CEO, with sufficient insight to make it healthy rather than destructive, charismatic rather than ruthless. Preparedness to take one for the team. There’s nothing that builds loyalty like the boss taking the rap for some executive screw-up for which they themselves weren’t actually responsible; or going into bat , notwithstanding the inevitable belting from above, for a staff bonus when there’s been a big team effort but the KPIs haven’t strictly been met. A spouse or partner prepared to go on the journey, or at least let the protagonist get on with it. The time demands on a CEO are relentless (see point no. 1) and there’s no such thing as a weekend, let alone a holiday, without the job intruding. Someone to periodically debrief it all with, preferably outside the organisation. Sometimes it’s a mentor or coach; sometimes it’s a guru; sometimes it’s a mate. In rare cases it’s that understanding spouse/partner. Whoever it is, the value of having a non-involved but open listener to spill to is one of the best pressure valves going. So given these factors, what is the pass-mark for an effective CEO? I’m tempted to say 100%, but realistically 6 out of 8 will likely get you there. There are probably work-arounds for most of the above if you can’t tick any particular box. I’m certain, though, that without a big dose of point no. 1 you may as well not apply. No. 7? Well, make your own call on that one. I gave myself 5 out of 8 and withdrew from the pursuit of that particular milestone. I like going on holiday without a BlackBerry. P.S. This analysis doesn’t look specifically at leadership, a whole other dimension.